Last month, when Rackspace(s rax) hired Morgan Stanley in May to explore its options — including a possible sale to another company — it no doubt hoped to drum up a lot of interest. But that, apparently, has not happened, and on Friday the company’s stock fell 7.3 percent and was down 9.1 percent for the week. I’m betting that’s not the sort of interest it was seeking. Depending on how you read the cloud market, all is not lost however. Two major U.S. players — Hewlett-Packard (s hpq) and CenturyLink (s ctl) — could still be in the running for Rackspace, according to RBC Capital Markets’ Managing Director Jonathan Atkin, who follows the company. HP CEO Meg Whitman recently said she would consider deals in the $4 billion to $6 billion range and CenturyLink, despite making two cloud-related acquisitions — Savvis and Tier 3 in the past few years — also indicated it could make acquisitions in strategic areas, he said. HP, which fields its own OpenStack cloud technology, might find Rackspace and its OpenStack know-how of interest. A CenturyLink spokeswoman declined comment. HP could not be reached for comment. And then there are foreign telcos that might want to bust into the U.S. business-to-business cloud market — NTT, which bought Verio years ago and RagingWire more recently, is one example, Atkin suggested. Valuation is tricky, however. 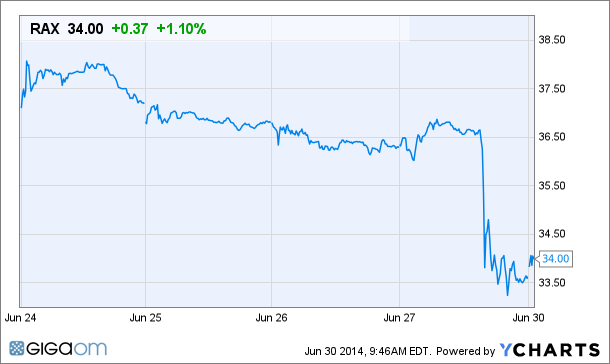 Rackspace’s market cap was $4.8 billion at close of business on Friday. If you view the landscape as one where Amazon(s amzn), Google(s goog) and Microsoft(s msft) have sucked the air out of the room on the public cloud side, and where most of the legacy IT players — VMware(s vmw), HP, IBM(s ibm), Red Hat (s rhat) et al — have already made their cloud play, Rackspace might look pricey and superfluous. But if those same companies see an opportunity for customer and technology acquisition, Rackspace may look tempting — depending on price of course. In any case, Rackspace is in the spotlight for good or ill. It lost two of its top OpenStack evangelists to Metacloud two weeks ago. When Rackspace CEO Lanham Napier retired in February, company Chairman Graham Weston stepped in as interim CEO and said the company was in no hurry to name a new permanent CEO. Taylor Rhodes (pictured above at Structure 2014) was named president in January. It seems to me that HP would be the most logical choice. They are all in with OpenStack and even have their own public cloud running off of it. However they don’t seem to have gotten any traction with it. If HP bought RackSpace they would practically own the OpenStack development. Agree. It is a matter of price though. 5B seems too high.